This chapter is mostly about the history of functional programming, so for people who don’t like history, I first share a short lesson that just explains those terms. After that, I add a full version that discusses the invention of the lambda calculus, several key people in the FP history, and languages like Lisp, Haskell, and Scala. For those who don’t like history, this is the shortest possible “history of functional programming” I can provide that explains where the terms lambda and lambda calculus come from. Back in the 1930s, Alonzo Church was studying mathematics at Princeton University and began using the Greek symbol λ — “lambda” — to describe ideas he had about these things called functions. Because his work preceded the development of the first electronic, general-purpose computer by at least seven years, you can imagine him writing that symbol on chalkboards to describe his concept of functions. So, historically speaking, that’s the short story of where the term “lambda” comes from; it’s just a symbol that Mr. Church chose when he first defined the concept of a function. If you’re familiar with other programming languages, you may know that Python and Ruby use the keyword lambda to define anonymous functions. If you’re not familiar with anonymous functions, I wrote about them in the Scala Cookbook, and I also provide an overview of them in the appendices of this book. If you’re interested in the deeper history of FP, including a guy named Haskell Curry, the relationship between FORTRAN and FP, and languages like Lisp, Haskell, Scala, and Martin Odersky’s work that led to the creation of Scala, continue reading the next section. Otherwise feel free to move on to the next chapter. Back in the 1930s — 80+ years ago — gasoline cost 17 cents a gallon, World War II hadn’t started yet (not until 1939, officially), the United States was in the midst of the Great Depression (1929-1939), and a man by the name of Alonzo Church was studying mathematics at Princeton University along with other legendary figures like Alan Turing (who finished his PhD under Church) and John von Neumann. However, other research shows that the choice of the name wasn’t entirely arbitrary. After all, this is the man who founded the “Journal of Symbolic Logic,” so I personally doubted it was completely arbitrary. I imagine him drawing this symbol on chalkboards and papers in the 1930s, so my first guess was that he wanted a symbol that was easy to read and write, but fortunately you don’t have to rely on my guesswork. The book “Paradigms of Artificial Intelligence Programming: Case Studies in Common Lisp,” by Peter Norvig discusses the origin of the λ symbol, as shown in Figure [fig:historyLambdaPeterNorvig]. Note that Mr. Norvig also states that a better name for lambda would be make function. The book Becoming Functional states that lambda calculus introduced the concept of passing a function to a function. I cover this topic in the Scala Cookbook, and discuss it in several lessons in this book. While Mr. Church’s lambda calculus was well known in its time, it’s important to note that the ENIAC — generally recognized as the world’s first electronic, general-purpose computer — wasn’t put into action until 1946, and it fit Alan Turing’s ideas better than Mr. Church’s. One of the most interesting computer programming books I’ve ever come across is The Little Schemer. (Scheme is a dialect of Lisp.) The Little Schemer is written in a conversational style between a student and a teacher, where the teacher’s main goal is to get the student to think recursively and see patterns. Another book named Land of Lisp may hold the distinction as being the programming book that looks most like a cartoon. It’s another good resource, and it’s a much more complete introduction to the language than The Little Schemer. If you happen to work with Gimp (GNU Image Manipulation Program) and want to automate your tasks, you’ll find that it supports a scripting language named Script-Fu by default. Script-Fu is a dialect of Scheme. 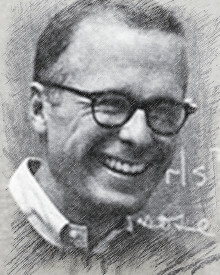 I created the sketch of John Backus from his image on ibm.com. Mr. Backus did much more than this, including his work on the ALGOL 60 programming language, and creation of the Backus-Naur Form (BNF). But in terms of functional programming, his 1977 lecture was an impetus for additional research. Erlang is not a pure functional programming language like Haskell, but it’s an actor-based, message-passing language. If you’ve heard that term before, that may be because the Akka actor library was inspired by Erlang. If you’ve used Akka, you know that one actor can’t modify the state of another actor, and in this regard, the Erlang message-passing architecture uses FP concepts. In that statement, Mr. Armstrong’s “processes” are equivalent to Akka actors, so the same statement can be made: “Actors share no data with other actors, and because of this we can easily distribute Akka programs over multicores or networks.” As you’ll see in the lessons to come, using only immutable values lets us say the same things about pure FP applications. Haskell Brooks Curry (1900-1982) has the distinction of having three programming languages named after him (Haskell, Brook, and Curry). 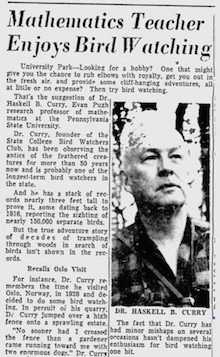 In addition to those, the process of “currying” is also named after him. For a longer and more technical account of Haskell’s history, I recommend searching for a PDF titled, “A History of Haskell: Being Lazy With Class,” by Paul Hudak, John Hughes, and Simon Peyton Jones, three of the co-creators of Haskell. In that paper you’ll learn a few more things, including that Haskell was inspired by a programming language named Miranda). If you want to learn Haskell I highly recommend starting with that book. Real World Haskell is another good resource. The maturation of the Haskell language and the nearly simultaneous introduction of multicore CPUs in mainstream computing devices has been a significant driving force for the increasing popularity of FP. Because CPUs no longer double in speed every two years, they now include multiple cores and Hyper-threading technology to provide performance gains. This makes multicore (concurrent) programming important, and as luck would have it, pure functions and immutable values make concurrent programming easier. Martin Odersky was born in 1958, and received his PH.D. under the supervision of Niklaus Wirth (who is best known as a programming language designer, including the Pascal language, and received the Turing Award in 1984). 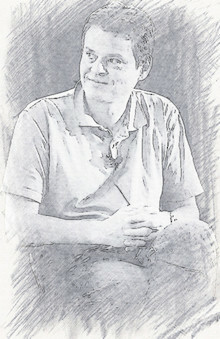 I created the sketch of Martin Odersky from the image on his Wikipedia page. 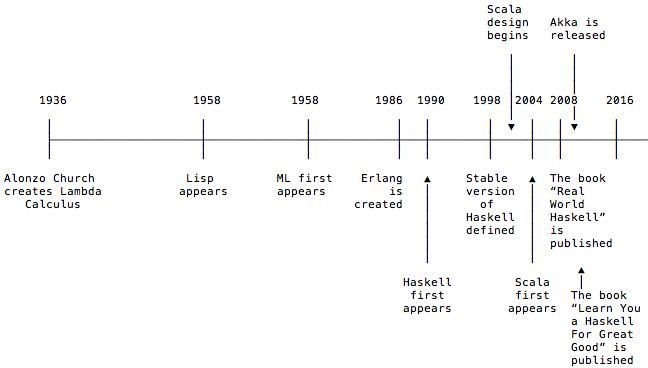 Figure [fig:timelineEventsInFpHistory] shows a rough timeline of some of the important events in the history of functional programming. It’s important to note that Mr. Church most likely had no interest in things like (a) maintaining state over long periods of time, (b) interacting with files (reading and writing), and (c) networking. In fact, I’m pretty sure that the concept of a “file” had not been invented in the 1930s; packet-switching networks weren’t invented until the late 1960s; and DARPA didn’t adopt TCP/IP until 1983. This is important, because as mentioned, pure functional programs consist of only immutable values and pure functions. By definition, they can’t have I/O. When I write about monads later in this book, I like to remember that lambda calculus was invented in 1936, but monads weren’t described (invented) until 1991, and weren’t added to Haskell until version 1.3, which was released in 1998. That’s 62 years in between (a) lambda calculus and (b) monads to handle I/O in Haskell.